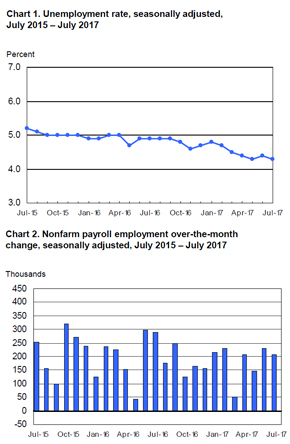 The July Employment Situation Report from the Bureau of Labor Statistics revealed a 0.1 percent decline in the U.S.’s unemployment rate – to 4.3 percent – and a gain of 209,000 jobs in total nonfarm payroll employment. According to Markets Insider, projections for the unemployment rate’s small decline were spot-on, while economists’ estimate of jobs that would be added in July – about 183,000 – missed the mark. Total jobs added suffered slightly compared to June, which saw 220,000 jobs added. Some industries that saw an uptick in June, such as healthcare, experienced further improvement, while other sectors, such as food and professional and financial services, showed new increases that hadn’t been seen the previous month. Also, the number of Americans classifiable as “long-term unemployed” remained static at around 1.8 million as it totaled the previous month, but that trend has seen gradual reduction for most of the year, per previous data releases by the BLS. Both food service and professional and business services saw large job gains – of 53,000 and 49,000, respectively. Employment within the healthcare sector increased by 39,000, slightly more than in June, and notably outpacing the 2017 average of 24,000 new jobs in the field per month. Mining, meanwhile, saw minor growth of only 1,000 jobs added, and several sectors, including construction, manufacturing, information, transportation, retail, financial services and government, saw no notable movement in either direction. As noted in The New York Times, many economists consider a one-two punch of strong wage growth and a high rate of labor participation to be among the most reliable indicators of a strong economy. The participation rate earned significant attention in 2016 due to its decline, hitting lows not seen in the past several decades and fueling perception of economic downturn in spite of a fairly low unemployment rate – around 4.7 percent for much of last year. Any significant increase in this metric would thus engender increased confidence in the overall economy. The labor participation rate remained steadfast at 62.9 percent for the month – where it has remained for the greater part of 2017. Average hourly earnings for all nonfarm employees rose 0.3 percent in July, slightly above the 0.2 percent wage growth experienced in June. Although not as high as many financial leaders might like, news of this growth and the generally strong jobs report caused increases in both stock futures and Treasury yields, according to CNBC. Probability of an increase in Federal Reserve interest rates also strengthened, rising to 45 percent from the 41 percent noted as recently as Aug. 3, 2017. Overall, while the figures in the July BLS labor report did not show uniform improvements, its findings nonetheless constitute fairly positive news.